Play with fire, in your heart, in your hand, and because people tell you not to. The new Solaris by Kinetic, featuring the AVC Pearl coverstock, glides effortlessly through oil and grips dry like no other ball on the market. The low RG Trailblazer core generates an early roll ensuring smoothness throughout the lane. The Kinetic Solaris gives you more length and more back end than ever before. First review for the ball so here we go. As you may already know, the Solaris has the same cover as the Break Pearl, which I like. 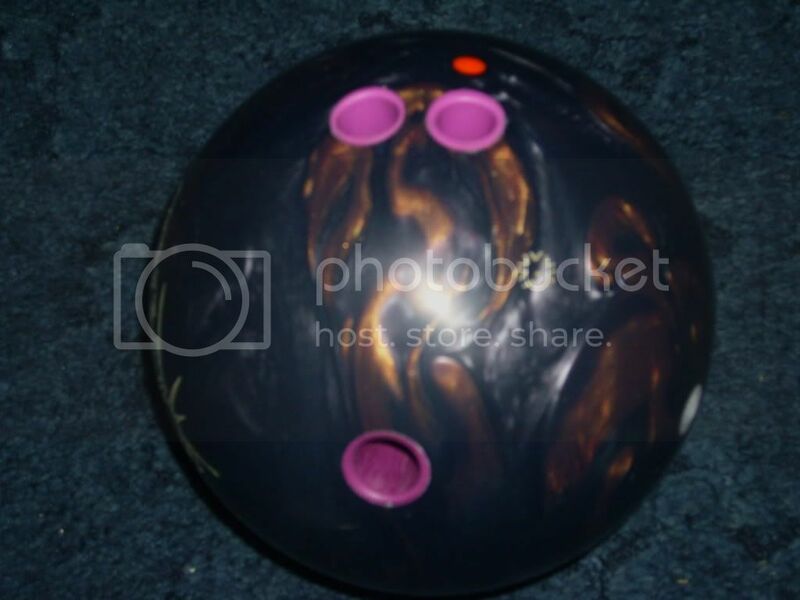 Threw mine on a fresh THS and it got down the lane and made its move into the pocket to smash the pins. Very forgiving ball, I missed right and it went out to the 1 or 2 board and snapped back for a strike. Great ball, absolutely recommend getting one. Hope to see more releases from Kinetic in the future. Solaris rating 10/10 for sure! My house is 43ft of oil on synthetics with clean backends. Drilled my Solaris with the pin to the right of my ring and 1/4 inch above. The CG is under my ring finger 3 inches down. Last night in league I went stone 9 then off the sheet. Second game I went 10 pin, 10 pin miss and then the next 8. Third game I did not make a large enough adjustment and the ball came up high first three shots. This ball clears the heads easy, revs up in the mids, and uncoils-snaps-peels (insert your adjective) at the break point and keeps the pins very low. Carry down is not a problem w/ this ball. Compared to my Break Pearl that I love, this ball is sharper off the break point and overall stronger. This ball was merely an experiment to see what the double thumb layout is all about. I was also very curious to compare this to my Break Pearl and AMF Villain to use when the pattern 'opened up'. OOB finish was like "yeah...another strong over/under pearl" which I have not matched up well with this season. After reading a post where a fellow BR member mentioned using a worn 4k pad. I said, wth and gave it a try. WOW...it's like a whole different ball. It gave me a very similar look to my Villain (also reviewed) but with a slightly stronger mid-lane read. This ball revs forever, it makes me look almost 'cranker-esk' with my lower end tweener release. With the lite 4k applied to the cover the over/under is now controlled reaction off friction. VERY release friendly, trust me on that one as my shot execution could surely use more consistency! The Solaris also carries similar to my Villain...just plain phenomenal. Having both the Break Pearl and the Solaris, I cannot say for sure if the Solaris is 'better' as they're not laid out the same. I can say I never got the same look from my Break Pearl with the same cover prep. With that said, the Solaris is in my bag and the Break Pearl will be going up for sale very soon. Super job to the Seismic (Kinetic) and the 900 Global teams for producing this awesome ball. It's somewhat disappointing to learn the Solaris is no longer in production. I highly recommend giving this ball a try if you're looking for a consistent, yet strong reactive pearl. UPDATE 7/14/09: The Solaris is the best I've ever thrown on the THS. If I could only use two words to describe it they'd be consistent & carry. My strike % with this ball is through the roof. Best piece in my arsenal...cannot recommend enough. 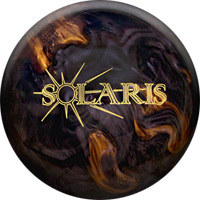 I wanted to try out a stronger pearl ball that I could use for medium to med/heavy conditions so I got the chance to try the Solaris. First tried it with 2000 grit with polish on a THS and it goes kind of long but with a very strong backend movement. And when I mean strong, I mean "jumpy" strong! I played it straight up the 10 board and it was abit too much so then I moved a few more boards to play it around the 13-15 board and got a better feel letting it go the 5 board at breakpoint. I would say that the reaction was skid/flip at best and was a foot earlier than my Power Machine but with similar backend power. Pin carry was simply fantastic though the strength of the ball would tend to send it way left if it hits the dry too early. Also played a deeper line once the lanes starts to open up but the Solaris had a habit of passing the breakpoint and coming up very short of the pocket. Room for error was good as long as I wasn't way off my mark. Recently, I took off the shine and tried it 2000 grit dull and I did get it to handle alittle more oil and smoothed out the backend but it needs some oil in the heads to get the Solaris pushed down the lanes. Carry was still great with less flip. Probably would have given this one an 8 if not for some inconsistent reactions playing it down and in and extreme deep. I really like the skid/flip reaction with the polish and would be a nice addition to have during league. Wouldn't mind throwing the Epicenter when Seismic release it next. If you want to try something new from a newer company, the Solaris is worth looking into. Good ball under the surface! SPECS:Rico drilled OOB Surface recently brought down to 2000 abralon. T&O Lanes: My league house T&O is very old school over the top returns and no auto scoring just to name a few. Flying backends Guardian up front and old wood for the next 40 feet. In OOB Surface the SP (Solaris Pearl) was almost enough. Started the night playing about 14 out to 7-8 and would have a great look through about 5 frames, but carry down would show up and the ball would not recover even moving right to find more dry it was picky and over under. Was impressed with it on the fresh but as soon as 1 game was on the lane the ball became unusable. PBA Viper: On Brunswick Pro Anvilane lanes. OOB surface on the SP again. Playing relatively straight 12 or 11 out to maybe 9-10 putting a fair amount of speed in it to hold it back from hooking to early I murdered the rack. went 687 in three. Ball Opened a nice 4 board area to play with roughly two board of pull and two boards of swing room. Reaction on Viper was everything it was not on the THS. PBA Shark: Surface at 2000 Abralon Brunswick pro Anvilane lanes. As mentioned in my post of 2/16/2010 I started with the Ultra Tactics and had no sucess going 160 160 the first two games with about 8 or more splits. Pulled the recently dulled Solaris Pearl playing almost the same line the SP made the Ultra look stupid. Went 220 220 to finish my four games of practice. Played about 14 out to 5-6 which seemed like a pretty big swing to me for a pattern this long and heavy. REACTION: Even though it is RICO drilled the SP has a momentous backend move, in both dull and polished surfaces. Even on Shark the ball screamed at the 1-3 after clearing the oil. on Viper with a slight hand adjustment smoothed the backend really nice allowing a much smoother transition from the oil to the long dry at the backend of the pattern very very versatile piece with only slight surface and hand adjustments. HIT/CARRY: Pretty rocking especially dull it had a pretty good punch, not MoRich punch but it had more than enough to get the ten pin out. Keeps pins low and mixes well on light hits also heavy hits go surprisingly easily for me when this ball is in my hand. OVERALL: Great Piece here especially dull, very strong late on the lane and allows a bowler alot of room for error which we all need at some point. gives a great look across alot of conditions and is easily adjustable and versatile what more could you ask for? Other than the ball to be re-released? DRILL:70X4X30 500 abralon with Storms First step over the top of that. NOTE:With the above layout the Solaris Pearl (SP) acted as my bench mark ball for most of the summer and all of this season so far. I had it plugged and redrilled to a different drill pattern last week. The review of Solaris Pearl is for the drill pattern mentioned and only that drill pattern. SUPER BOWL: Older Anvaline surface well maintained, Regular THS Oil pattern I would say a hair over meduim volume. SP was killer on this pattern. Playing about 17 out to 8 Break point at 44 feet. Solaris Made a real hard arc to the pins No snap involved it was quick move but easy to read and adjust with. As more games were played I would bump in farther moving in to about 20-22 at the about 10 for the break still at about 44 feet. SP Still had a great recovery and great continuation through the pins even with my ball speed which can hinder recovery when I get that deep from time to time. PBA Patterns: I have used SP on almost all of the PBA Patterns and this is what I have seen for its uses. On Shark the SP made an apperance during the transition, some of the other bowlers on the pair were playing strighter with duller gear, I had started very deep with a much stronger ball. My look went away and I moved right and started bouncing off their Break point. Played 14 out to 8 putting good hand in it I had no issues getting it back to the pocket adjusted accordingly and had a look for the remaining games of the block. On Viper again after the transition I used SP to get easier length while playing the same line that I did with a stronger ball when the pattern was fresh. about 22 at the arrows out to around 12 at 40 feet. Scorpion, great look here going straighter 11 out 7 at around 42 feet strong smooth move off the spot. On the fresh with wooden lanes. Did not expect to see it work that well. Cheetah SP is not the proper ball for me on the pattern. HIT/CARRY: This ball is not a brawler like MO's gear or Storms. It almost has a finesse about its hits. Carry is probably the best you have never seen. If the SP hits 1-3 light, heavy or flush, the ball will carry. And it is very consistent about it, very few backrow leaves, even on bad shots SP will get the pins to lay down. The Trailblazer core is just amazing easily a equal to any other sym on the market today. COMPARE: To Nsane LevRg same drill pattern. OOB Surface for the Nsane. Solaris is longer and more angular off the spot, Nsane will handle a touch more oil but is more condition specific. Solaris carrys much better. From what I have seen of a Virtual Energy I would say they are pretty evenly matched for as far as how much oil they can handle, I would say the VE is a touch later the SP a touch earlier. Carry wise SP takes it, I see guys with the VE struggling and the SP same type of ball is eating a pattern alive. OVERALL: One of my favs and I hope it stays in the bag a long time.